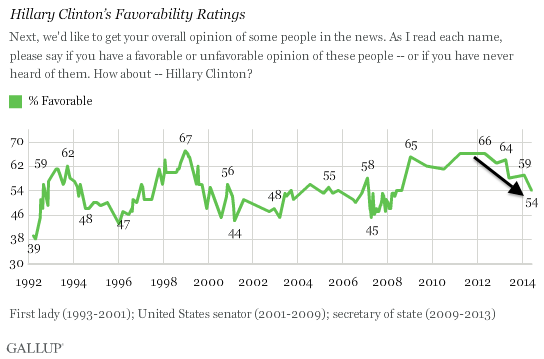 Cantor’s Defeat Isn’t Good for Hillary. It’s Bad for Her. 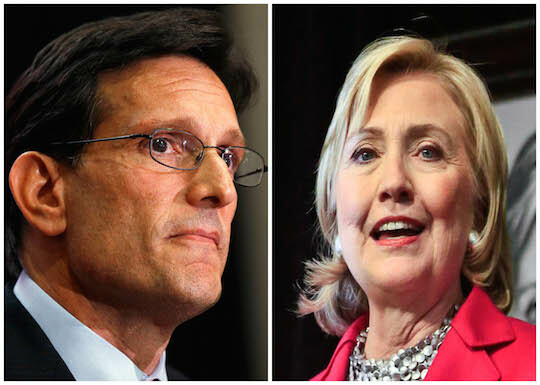 The thought leaders have spoken: House Majority Leader Eric Cantor’s (R., Va.) shocking primary loss on Tuesday is great news for Hillary Clinton. HIllary says Eric Cantor was defeated "by a candidate who basically ran against immigrants." Another explanation: Cantor’s support for "immigration reform," as defined by the thought leaders, was simply an inevitable byproduct of the real reasons voters chucked him out of office. Cantor is the consummate Beltway insider. He palls around with consultants and lobbyists. There is a 100 percent chance that he will soon accept a high-paying gig as a lobbyist/consultant/adviser. He was a close ally of the Chamber of Commerce, which many on the right have criticized for pursuing an agenda that is "pro-business" but anti-free market—a distinction Cantor’s opponent Dave Brat drew again and again on the campaign trail. These ties necessitated Cantor’s support for comprehensive immigration reform, as almost every corporate interest group has been begging for the influx of cheap labor it would provide. Cantor was, by all appearances, willing and able to cash in on his political power. He was short U.S. Treasury bonds during the 2011 debt-ceiling negotiations. His net worth more than doubled during his time in Congress. His office was busted for trying to water down the STOCK Act, a bill to prohibit insider trading among members of Congress and their family members. Brat often highlighted the STOCK Act shenanigans, calling them the "smoking gun" of the campaign. Cantor never seemed to take a firm position on important issues. Even on immigration reform, which he obviously supported, the former majority leader distributed campaign mailers boasting about how he stood up against President Obama’s plan to give "amnesty" for "illegal aliens." He came across as insincere. He was out of touch with his constituents without realizing it. He was more interested in becoming Speaker of the House than in running for reelection. He expected to win, and assumed that victory was inevitable. And yet the thought leaders have decided that Cantor's defeat is great news for another overly cautious/calculating/confident politician/consummate Beltway insider who has close ties to Wall Street and to other corporate interests, has aggressively cashed-in on her political experience, is sufficiently out of touch as to invite sympathy upon herself for enduring the "struggle" of financing the purchase of two multi-million dollar mansions, and who clearly thinks the White House, much less the Democratic nomination, is hers for the taking. On the other hand, Hillary Clinton has written multiple memoirs. This entry was posted in Politics and tagged 2014 Election, 2016 Election, Democratic Party, Eric Cantor, Hillary Clinton, Immigration Reform, Republican Party. Bookmark the permalink.